The boom in the premium segment of the automobile industry is not just limited to high-end cars, but increasingly includes motorcycles with an engine capacity of more than 500 cc. And, once again, the buyers for these bikes are HNIs (high networth individuals) who view these models as a fashion ‘statement’ as well as an essential part of their leisure activities. It’s no surprise that the top-end of the motorcycle segment, which constitutes less than one per cent of the total sales in the broader two-wheeler segment, is growing at over 35 per cent on an annualised basis for the past few years. The above trend, is in contrast to the sluggish demand in the mid-range two-wheeler category. To leverage this demand, several overseas players including Triumph Motorcycles, DSK Hyosung and Indian Motorcycles, have entered the local market and posing strong competition for the global icon Harley-Davidson. “Demand has been especially strong from entrepreneurs as well as college students and senior corporate executives,” said Shivapada Ray, COO, DSK Hyosung, a South Korean premium motorcycle manufacturer. The premium segment, which includes motorcycles priced from Rs 2.5 lakh, currently has annual sales of nearly 2,700 units per year, and it is expected to cross 3,500 by next year. Senior officials at these companies stressed the importance of showcasing their range at ‘experience’-based events for “enthusiasts”, and also close ‘engagement’ with the target audience. As part of that strategy, Harley Davidson recently organised a HOG (Harley owners group) rally in Goa, and 1,000 customers of this brand rode along with 6,000 biking enthusiasts. They are not alone, and UK-based Triumph Motorcycles will shortly organise its well globally acclaimed ‘Tridays’ in the country, which sees ‘fans’ from across the globe participating. “Our customers form part of the Riders Association of Triumph, and we ‘engage’ with them from time to time,” said Vimal Sumbly, MD, Triumph Motorcycles India. Apart from expanding their repertoire in the local market, foreign motorcycle manufacturers are also paying considerable emphasis on a pan India distribution network. As a result, DSK Hyosung, which currently has 34 outlets across the country, the largest distribution network in this segment, and it had recently opened a showroom in Nagaland. Ray of DSK Hyosung pointed out that they generate more than one-fourth of their total sales in smaller towns across the country, and also emphasised that their dealers earn “healthy” margins from servicing these models. Similarly, Harley-Davidson has recently added dealerships in Pune and Jaipur, and expanded its dealer network to 13. Anoop Prakash, Managing Director, Harley-Davidson India, highlighted that they are further expanding their network to tier-II cities like Guwahati, Coimbatore and Surat. And, Triumph Motorcycles is all set to launch its dealerships in Mumbai Pune, Delhi and Chennai apart from its present stores at Bangalore and Hyderabad. Premium bike brands akin to their counterparts in the four-wheeler luxury segment are also offering models which are more “affordable”, in a bid to widen the target audience. And, Harley-Davidson had earlier launched its Street 750 priced at Rs 4.10 lakh, while Triumph Motorcycles’ offerings are available from Rs 5.75 lakh. Sumbly of Triumph Motorcycles pointed out that their sales target for the first six months of their operation in the country is 500 units, and that would rise to 1, 500 a year from now. Nevertheless, players like Indian Motorcycles recently launched their range of Chief range-Classic, Vintage and Chieftain, with prices ranging between Rs 26.5 and Rs 33 lakh. Senior executives at premium motorcycle companies, however, emphasise that high import taxes on these models, results in local prices that are nearly double to those prevailing in the US. And, in a bid to minimise the above impact, Harley-Davidson assembles nine of the 12 models it sells in India from completely knocked down (CKD) kits. 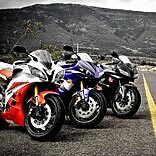 No doubt, an expensive ride, but premium motorbikes are en vogue.